By serving the jnani, his grace is bestowed upon us and his divine qualities are aroused in our internal organ readily. If I had not served my Gurudev (Swami Sri Leelashahji Maharaj), would it have ever caused Him shortage of any kind? Would it have obstructed any of His activities? No. I served Him for my benefits. When I had gone to my Gurudev, I was given a four feet wide, five feet high and 6 feet long cottage to live in. The roof being low in height and a door that was small, the only way to enter the cottage was by stooping. I could not even fully stretch my legs inside it while sleeping. With whatever little money I had, I used to buy green grams and salt. Once in a day, I used to boil the green grams, add a little salt to it and drink it. Since the beginning I had to go through this kind of forbearance. Except for the duration for which I used to boil green grams for myself, the rest of my time was devoted to serving my Gurudev. I used to read to my Gurudev the letters sent by His devotees and send responses to these as per His instructions. I used to water the garden, wash utensils used for preparing food for the visitors, buy vegetables from the market and carry out other miscellaneous tasks. In the remaining time I used to meditate, contemplate on the Divine and listen to Gurudev’s satsang. I always used to take utmost care not to do anything that may displease my Gurudev. In the presence of my Gurudev, I used to speak less, within limits and only as much as I was required to. Even now when I recall those sweet days, I am overwhelmed with joy! The bliss that I used to experience at the holy feet of my Gurudev, aha, that can nowhere be obtained. O, how I long for those days when I was fortunate to listen to satsang at the holy feet of my Gurudev! It is much more blissful to sit at the holy feet of Gurudev than to be a Guru…more auspicious…more joyful. Theft of God or Realization of God? All sảdhanả as are illusory so long as one does not know the essence of Self. My mind like a bird began soaring in the sky. The heaven was vacant, God being with the saints. The first time I had gone to live with my Guruji, when I was just a novice, I was stunned at His behavior. Later I realized that it was His grace and compassion that He lived with us so simply so that we also could comprehend His supreme experience and strive for the same. Sometimes, Gurudeva was so harsh that if someone were unfortunate, he would instantly run away. Sant Pritamdasji has thus proclaimed: The path of the Lord is for the brave, cowards dare not tread it. The period of sảdhanả is like a fierce battle field. It might be some good fortune and the grace of the Guru that I managed to live there. To stay at the feet of the Brahmajnảni is by no means an easy job. His loud voice, angry mood and harsh behavior would have scared any ordinary sảdhaka, who could not have endured it for even an hour. That is why not many disciples could live with my Gurudev for longer time. What can I tell you about the way Gurudev used to behave, the manner in which He used to scold! At that time it was my daily routine that I would take water only after having worshipped Lord Shiva and having made offering of water to Him. One day the idol of Lord Shiva and articles used in worship were stolen. Those who had stolen were being supported by Guruji and they were making fun of me. Though, worshipping Lord Shiva and making offering of water to Him is not bad at all. After taking my bath I used to bathe Lord Shiva. I used to cook my own food and consume it only after offering it to Lord Shiva. But now, my Lord Shiva was stolen. This way Gurudev made fun of me. On one hand I had not eaten anything the whole day; my God had been stolen. On the other, Gurudev was also making fun of me. Just imagine how it would have been felt? ‘What kind of a saint is he?’ - What if I had let such a foolish thought crop up in my mind? But that did not happen…thanks to the grace of my Gurudev. Later I realized that the abode of the Brahmajnảni is not meant for remaining entangled in external worship. My Gurudev had devised such a play to make me to turn away from external image of God to get established in the real Being of God. O how benedictory and unique is His compassion! How subtle is each and every word, each and every gesture of the Brahmajnảni Guru. How could an ordinary person realize that? Seeking far and wide, diamond-mine at home. 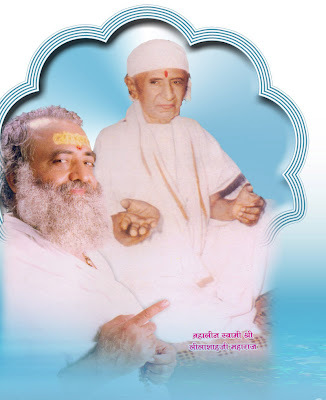 Without the Satguru who will, make you cognise that. What the Vedantanishtha great man can easily give you, no one else can - be it your mother, father, husband, wife, friends, Sankhya and Yoga philosophies or rituals and worship. Such great saints have transcended their identification with the body. By encouraging the seekers and if need be by even pushing them, they make others climb the Mount Everest of Knowledge.